If there’s one franchise that shouldn’t lend itself to Traveller’s Tales’ gleefully twee LEGO games, it’s Batman. With a movie series that prides itself on gritty, urban realness, a comic series that excels when it’s most twisted, and a rival game that’s bagged countless awards thanks to its ability to make slow-mo assault feel so enjoyable, cutesifying Batman for the kiddywinks simply should’t work. 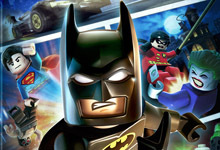 Yet after their unequivocal success with LEGO Batman back in 2008, everyone’s favourite angular Dark Knight is back – and this time he’s got more than a little help from his LEGO superfriends. Plot-wise, it’s as relatively throwaway as you’d expect for a game that needs to be accessible to seven-year-olds. After getting upstaged by Bruce Wayne at the Man of the Year awards, Lex Luthor reacts in typically megalomaniacal style and pushes for the Presidency. With the Joker helping him fix the ballot box along the way, it soon becomes clear to Batman that he’s going to need a little help from his super friends. 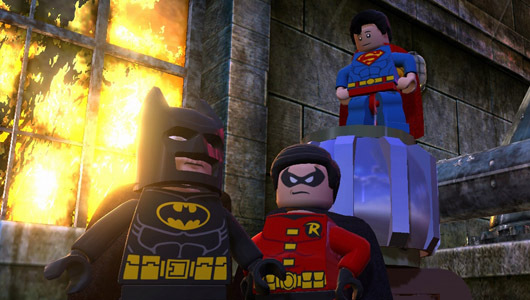 The first thing fans will notice is that after countless level-by-level adventures, LEGO Batman 2 embraces an open-world. LEGO Gotham’s an impressive place to get around, with loads to see and do/smash into mini-bricks, and some beautiful design work and weather effects to bring it to life. The core gameplay is standard LEGO – break your surroundings and enemies into bricks, collect whatever’s glowing and left behind, and then build something cool from the debris. This time though, Batman and co have an array of new power-specific suits to wear, and its extensive supporting cast change things up in a way that’ll make fanboys’ nerdgasm. Whether rushing around the city at blistering speed as the Flash, golden lassoing the bad guys as Wonder Woman, or taking to the skies as Superman (replete with John Williams’ goosebump-inducing score), there’s such an array of powers and mini-missions to play around with, that there’s enough to entertain young, old, fanboy and newbie alike. The whole package is hard to fault, and while it may not hold the same difficulty level as Arkham City, it certainly has the same ambition. Don’t be mistaken by the open wold promise of LEGO Batman 2. Sure there is an open world to explore, but it serves to be more of a hub to link missions rather than a true open world. This isn’t such a bad thing, as LEGO Gotham is a joy to drive/fly around. But the trouble comes with the jarring change from open world 3D to the usual Lego style 2.5D gameplay style. As soon as you start mission, the freeform nature of the ‘HUB’ is lost to restrictive side on gaming. Which would be fine if the camera didn’t hide some of the things you need to see. like platforms for example. It gets frustrating knowing there is a platform there but you can’t turn the camera to line up with it, making leaps of faith a gameplay style that I thought we had long-lost and forgotten. Another concern I had with the game were the various suits. Sure there are a hell of a lot of them, but I got the feeling that the puzzles were made for the suits. I can imagine the developers sitting around a table thinking. Oh I know, an Ice suit would be cool, lets force some puzzles in that would need an ice suit. I mean having an electricity suit just to zap a couple of engines seems wholly pointless, and dangerous too seeing as this particular level was water based with no apparent side effects from jumping into water with an electrically charged suit. Seems a bit dangerous seeing as this games is aimed at the more younger crowd. Finally the combat is also a let down, I never expected the vast variety that was offered in the like so Batman: Arkham City, but two hits and your out with your simple punch command seems woefully short of what’s expected in a game. don’t get me wrong, it sounds like I hated everything about this game, that’s not true, it’s just disappointingly another LEGO game that doesn’t really offer anything new aside from the rather small ‘open world’ section. If you haven’t found any joy in previous LEGO games and its unique style of play, then there is nothing here that you will enjoy. Thankfully the Humour is spot on, thanks to the now fully voiced LEGO Characters. It’s a delight to watch the cut scenes and look out for all the little in jokes, including a dig at Arkham City. It’s also a sight to behold to see all your favourite DC characters present and correct. Superman is brilliant as is the Penguin, It’s just a shame they are not used as much as you would want. This is really Batman’s game, which considering this is the second Lego Batman game, seems like a bit of a wasted opportunity to really explore the other heros. This is a technically great game, fully of fun and humour, let down by some wasted opportunities and a jarring change from 3D to pseudo 3D. definitely one for the youngsters, just teach them the perils of mixing water with electricity first.